Die Marvellous Beard & Moustache Box von Murdock enthält alle nötigen Pflegeprodukte für die Bartpflege und das Styling Ihres Bartes. Der Bart Moisturiser minimiert Irritation und macht spröde Barthaare wieder weich und gesund. Das Bartwachs verleiht die ultimative Kontrolle über den Bart an Wangen und Kinn. Beard Moisturiser contains: Aqua, Aloe, Barbadenis (Aloe Vera) Leaf Juice, Cetyl Alcohol, Behentrimonium Chloride, Dimethicone, Parfum, Helianthus Annuus (Sunflower) Seed Oil, Hydrolised Wheat Protein, Calcium Pantothenate (Vitamin B5), DMDM Hydantoin, Decyl Glucoside, Citric Acid, Menthol, Benzyl Benzoate, Linalool, Eugenol, Limonene, Benzyl Cinnamate, Cinnamal. 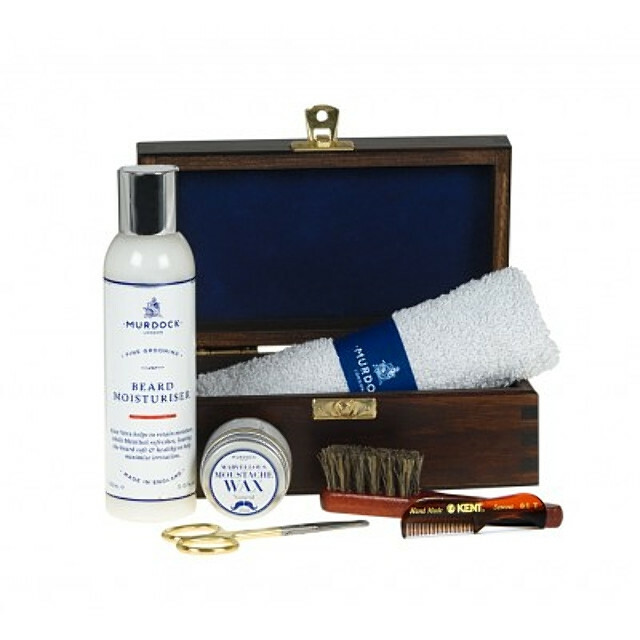 This complete grooming box contains the printed expert guides to having a mighty good beard and a marvellous moustache.